Progressive, iconic and unique are just three adjectives that describe the new home of the Atlanta Falcons, Mercedes-Benz Stadium. Located in downtown Atlanta, adjacent to their former home the Georgia Dome, the Falcons new stadium sets a new standard for all stadiums in the NFL. 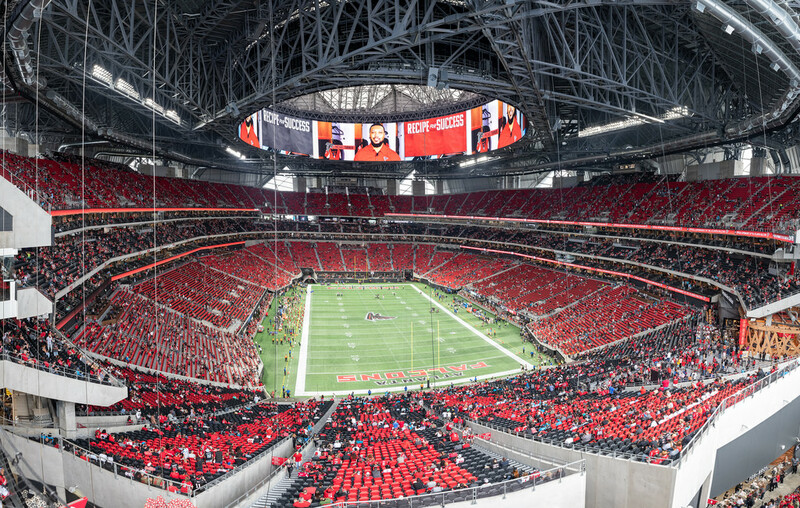 From the exterior to the interior Mercedes-Benz Stadium features a one-of-a-kind design not found in any other professional stadium. At a height of 305 feet, the stadium features a distinctive facade that consists of a light-weight plastic skin and a unique retractable roof that allows natural light to enter the stadium either through the roof being opened or by natural light entering the stadium through the north and east ends. The oculus retractable roof, that resembles a pinwheel, is reminiscent of the Roman Pantheon and a falcon’s wings. Consisting of eight triangle pieces, the roof can open or close within ten minutes. A 61,000 square foot outdoor fan plaza outside the stadium is a great place for fans to mingle before or after games. It features live entertainment, food and beverage options. A massive 41.5-foot tall stainless steel statue of a falcon is also located outside Mercedes-Benz Stadium. Inside Mercedes-Benz Stadium football fans encounter one of the most unique experiences in the NFL. The centerpiece is the 63,800 square-foot video board. This is not your average video board. It’s halo-shaped and located around the opening of the retractable roof. The 360 degree screen is 58 feet tall and 1,100 feet around. Accessing any area at Mercedes-Benz Stadium is a breeze as every level of the stadium features a 360 degree concourse that stretches around the facility. 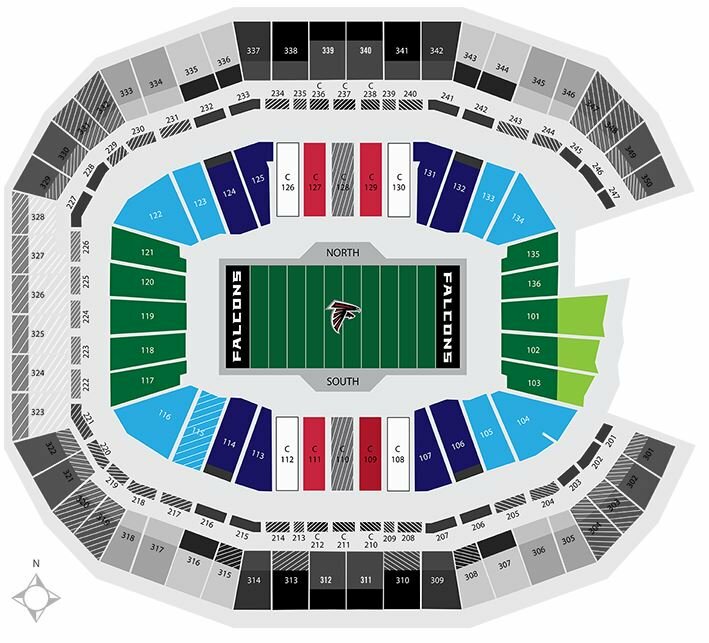 Mercedes-Benz Stadium has a seating capacity of 71,000 for Falcons games and is expandable to seat over 80,000 for special events. The lower deck encloses the playing field and additional seating decks are located on both sides of the playing field. Not only can fans watch the action on the field or scoreboard, they can see the Atlanta skyline through the Windows to the City. Located on the east end of the stadium, this floor-to-ceiling window, allows natural light into the stadium and views of downtown. Mercedes-Benz Stadium has numerous amenities. The stadium has 7,500 club seats, 180 luxury suites and numerous clubs and lounges including the Champions Lounge, behind the Falcon’s bench. Open to all fans, is the 100 Yard Club, a football field-length themed gathering and socializing area with concessions, bars and a beer garden. The stadium has over 600 concession areas with the cheapest concession prices in any professional sport. The stadium features many unique eating options, including Molly B’s Cookhouse, a southern-style chophouse. In addition to the halo videoboard, there is a 100-foot high mega column 3D video board and multiple LED ribbon boards to provide highlights and game stats. 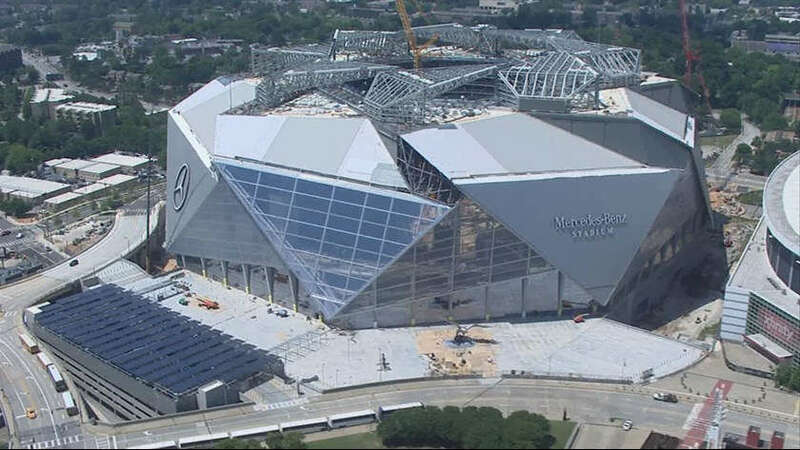 Construction of the $1.5 billion Mercedes-Benz Stadium began in April 204. The Falcons partnered with the Georgia World Congress Center Authority (GWCCA) to build the stadium. The GWCCA owns the stadium, and the Falcons operate the stadium. On September 17, 2017 the Atlanta Falcons will play their first game at Mercedes-Benz Stadium against the Green Bay Packers. Not only is the stadium home to the Falcons, but is the home to the MLS Atlanta United FC and the annual Chick-fil-A Bowl college football playoff game. The stadium will be hosting many premier sporting events in the coming years including the 2018 College Football Playoff Championship game, Super Bowl LIII in 2019 and the 2020 Final Four Men’s Basketball Championship.